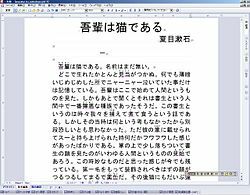 Ichitaro is a Japanese word processor produced by JustSystems, a Japanese software company. Ichitaro occupies the second share in Japanese word-processing software, behind Microsoft Word. It is one of the main products of the company. Its proprietary file extension is ".JTD". ATOK, an IME developed by JustSystems, is bundled with Ichitaro.